Fall is here. Now to figure out a costume. The weekend before this current one, I went with coworkers to a corn maze in North Georgia. We had to go through and find the photos of pumpkins. If we matched all the pictures to the pictures on the cards we were given at the start, indicated by writing down the name of the pumpkin, we could get ice cream at the end. The maze itself was easily exited, but we did have to go through and find the things. And, you know, get into the fall spirit. 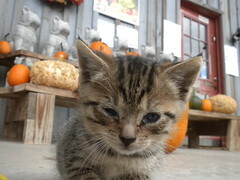 Another thing we did was take pictures of kittens and cats a-go-go, such as the one in the photo. The kittens were very tiny and the mother had an eye problem. Still cute. We also saw some falls for the fall in the Tallulah Gorge state park. I read that it was at one point a top tourist attraction in the South. The visitor center was nice, as was the view and the nice almost-changed leaf-peeping experience. We didn’t find much to eat, however, and went back to the ATL to fill our famished bellies, exhausted from climbing all those freaking stairs down to see the suspension bridge and the water. Now I’m mulling my Halloween plans (more travel? I must be nutzy) and what I’m going to costume myself as. I posted a bunch of themes on Facebook and have even more now: some kind of two-party political thing with donkey and elephant parts, Mod Squad, Clockwork Orange, lolcat, fairy with giant wins, tooth fairy, The Economy, modernist art, postmodernism, a hippie, Michael jackson, Kanye West, Balloon Girl, Internet Meme-a-palooza (crasher squirrel, Kanye, lolcats, you name it), a computer, an iPhone, a Google phone, the Twitter bird, a fail whale, a scrabble board, a keyboard, a social network, something from Alice in Wonderland, omg I don’t even know what I could be. Mom even suggested the Mona Lisa and I was intrigued at what could be done with that. There is no limit to my imagination, only to my artistic abilities and wherewithal. I like to go to Starbuck’s every now and then, and I’m not even talking about the one roughly 50 feet from my Place of Employment. I would rather go to a locally owned coffee house (that serves quality coffee), but it’s tough to find indie businesses in my corner of the OTP without a bit of travel. Anyways so the last two times I went to the particular ‘Bucks that I always go to, I have been the “every 50th customer.” This means I am eligible for TWO entries in the October drawing to win $1,000. I’m gonna give it a shot, you know? I figure this isn’t going to happen every day. And by the way, I’m kicking myself for repeatedly ordering the Pumpkin Spice Latte, which cost me more than purchasing an actual pumpkin. It’s not unpleasant, but it bears resemblance to neither pumpkins nor spice. It is a fine and enjoyable latte, however. It’s a different story when tasting pumpkin beer, however. That stuff doesn’t sit well with me. The last time I tried some I thought it tasted vaguely like, um, “upchuck,” and I didn’t make it beyond a few sips. I’m tempted to give it another shot, but of course, that’s what I always say about the Pumpkin Spice Latte. My picks at Starbucks are straight-up cappuccino, the cinnamon dolce latte and the chai latte. Even then I have to be careful to just drink a little at a time and spread it out over a few hours to avoid getting an uncomfortable stomach-irritating caffeine rush, and you know, to make it last. I’ve tried non-dairy and that helps a lot, but the soy milk doesn’t touch real milk. If I want something a little lighter I’ll go for a green tea lemonade, lightly sweetened. Delish. So… beyond that, I endorse Stephen Colbert for president. To be quite honest, he’s the only candidate I have any sort of affection or affinity for. I should also recap my recent journey to Stone Mountain Park for the pumpkin festival (featuring pumpkins that are probably NOT picked directly from a local patch, but I can pretend, right?). It was good times, and it was a lot easier to get there than I expected. Admission to the park itself is free (although attractions are not) so it’s a nice place to go and chill. I’m definitely going to go back and try out ALL the rides if I possibly can. I love the little touristy village inside the park. It reminds me of a Cracker Barrel on a massive scale. (And Stone Mountain Village itself has a charming little Main Street). What kind of weirds me out is the carving on the side, which is of course the main attraction of the whole thing. It’s a monument to the Old South, and you see a lot of, I dunno, characters going to see it. Then there was the kid who asked me if I was “from around here” and the lack of transit in the direct vicinity of the park. For these and other reasons, what I’m getting at here is that I sense that the crowd at this park is more representative of the population outside the city than the people inside it. If you catch my drift. And then there was a bunch of guys who drove by me and yelled “Hey!” to scare me. They laughed when I jumped. I don’t know, it was kind of a strange atmosphere over there peoplewise. Still, an enjoyable time, and I’ll definitely go back. Finally, I’m calling on all my readerses (I assume there’s at least a handful of you out there) to search for the term “adult balloon animals.” I’m currently the No. 5 result when you search for those words in Google, and the goal should be to become the No. 1 source of complete non-information on adult balloon animals. Together we can work together to make this happen.